Orally disintegrating tablets (ODTs) have become a rapidly growing area in the pharmaceutical industry during the last decade. Drugs exhibit the advantage of good absorption from the oral mucosa or intending for immediate pharmacological action can be formulated as ODT dosage forms. Rasagiline, a second generation, selective, irreversible inhibitor of mono amine oxidase type B drug, is primarily responsible for inactivation of dopamine in central nervous system (CNS) and has been used to treat long term Parkinson’s disease. As Rasagiline undergoes extensive first-pass metabolism resulting in low bioavailability, ODT dosage form can be a good alternative. In this study, Rasagiline ODT formulations were developed using Crospovidone, Ac-Di-Sol and Parteck® ODT superdisintegrants in two different concentrations, and also the unpleasant taste of the Rasagiline was improved with using a polymer; Eudragit EPO. 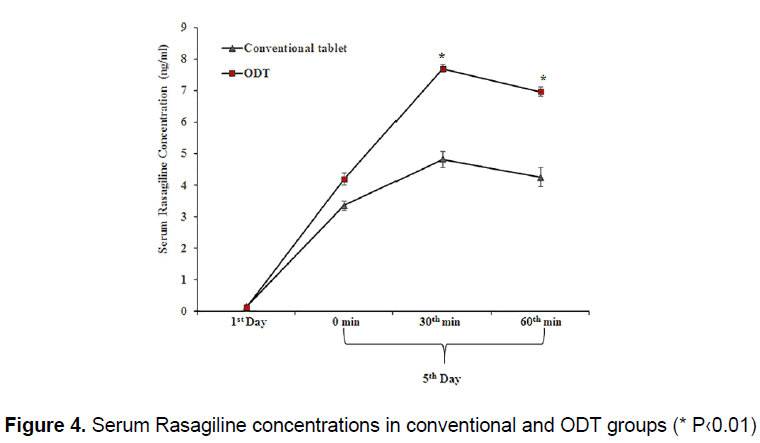 ODTs were evaluated by means of in vitro quality control tests and an in vivo animal study was performed to evaluate the bioavailability of the Rasagiline ODT versus conventional tablet. As a result, precompressional parameters for Rasagiline ODTs indicated fair flow properties. All Rasagiline ODT formulations satisfied the requirements of FDA for rapid dissolving tablets and allowed more than 85% drug to be dissolved within 30 minutes. Among the investigated superdisintegrants; Ac-Di-Sol is found more effective (7.6%) for its enhancing the rate and water uptake effect and dissolution. Thus, it can be concluded that Rasagiline ODTs may be an alternative solution to overcome the low bioavailability problems occurred with conventional therapy. Orally disintegrating tablets (ODTs) have received ever-increasing demand during the last decade, and the field has become a rapidly growing area in the pharmaceutical industry. The concept of ODTs has emerged from the desire to provide patients with more conventional means of taking their medication. Drugs exhibiting satisfactory absorption from the oral mucosa or intended for immediate pharmacological action and can be advantageously formulated in these dosage forms . Rasagiline is a second generation, selective, irreversible inhibitor of mono amine oxidase type B (MAO-B). MAO-B is primarily responsible for inactivation of dopamine in CNS and Rasagiline has been used to treat motor complications resulting from long term Parkinson’s disease (PD). However, Rasagiline undergoes extensive first-pass metabolism resulting in low bioavailability (36%) . Approximately 90% of an orally administered dose is metabolized before reaching the systemic circulation thus reducing systemic Rasagiline exposure . An ODT formulation of Rasagiline, facilitating extensive pre-gastric (predominantly buccal) absorption has recently been developed . Buccal absorption of Rasagiline should bypass the first-pass metabolism that is significant after oral administration, and permit the administration of lower doses. Maintenance of Rasagiline bioavailability accompanied by greatly reduced metabolite formation is potentially of enhanced therapeutic value to patients with PD. Thus, in this study, ODT dosage form was developed as a new approach to improve oral bioavailability of Rasagiline. In order to achieve this purpose, in the first step of the study, a new ODT form of Rasagiline was developed as an alternative solution to reduce pre-systemic metabolism, thus higher plasma concentrations and also the unpleasant taste of the Rasagiline was improved with a novel approach of using a polymer; Eudragit EPO. As the ODT formulations can rapidly disintegrate without water in the mouth within a few seconds, taste masking of active ingredients gains importance in these systems. In our previous study, preparation of ketoprofen-Eudragit EPO taste masked granules that were prepared with a heating and granulation process allowed a marked improvement of the initial drug taste in fast disintegrating tablet formulations without affecting the dissolution rate . In this study, we wanted to examine the Eudragit EPO’s taste masking effect without the pre-granulation process, so we used Eudragit EPO without any pre-granulation process with the active compound. The key parameters that are to be considered in the process of formulating an ODT are not only the taste but also the disintegration time. Disintegrants are substances or mixture of substances added to the drug formulation that facilitates the breakup or disintegration of tablet or capsule content into smaller particles that dissolve more rapidly than in the absence of disintegrants . To facilitate rapid disintegration of ODT formulations generally contains high levels of disintegrants. Thus, chemically modified disintegrants termed as “superdisintegrants” have been developed to improve the disintegration processes. The levels of the superdisintegrants used are generally 10–20 wt% of the formulation, but it can be higher or lower in some cases depending on the level and characteristics of the active pharmaceutical ingredient (API) and the desired release profile. Selection and optimized concentration of superdisintegrant is critical point for developing an ODT formulation by direct compression. It must not only quickly wick saliva into the tablet to generate the volume expansion, but also must exhibit good flow properties and content uniformity. Although the superdisintegrant primarily affects the rate of disintegration, when used at high levels it can also affect mouth feel, tablet hardness, and friability . While formulating Rasagiline ODTs three different superdisintegrants; crospovidone, Ac-Di-Sol and Parteck® ODT were used to examine the influence of the superdisintegrant type and concentration on ODT properties. Crospovidone is an insoluble, neutral cross-linked homopolymer of N-vinyl-2-pyrrolidone. It is available in various particle sizes . It facilitates rapid disintegration by water wicking and swelling [6,8]. Crospovidone is reported to draw water into tablet by capillary action due to its porous particle morphology, resulting a secondary swelling and rupture of interparticulate bonds and finally tablet disintegration takes place . Ac-Di-Sol is one of the trade names of croscarmellose sodium (a cross linked derivative of sodium carboxy methyl cellulose). Some of the carboxy methyl groups of Ac-Di-Sol are believed to crosslink in the cellulose chain of the molecule, thus the swelling process of Ac-Di-Sol is being accomplished by dehydration . The use of co-processed, functional excipients that are predominantly based on polyols (such as mannitol, xylitol, and sorbitol) or carbohydrates, in combination with disintegrants is one of the methods to design an ODT dosage form. These co-processed excipients are generally designed to physically modify their properties in a manner that is not achievable by simple physical mixing and without significant chemical change . Parteck® ODT consists of a combination of 93% spray-granulated mannitol and 5.4% croscarmellose sodium . It is highly compressible at low compaction forces, which permits the formulation of robust tablets that still dissolve quickly in the mouth and rapidly release the active ingredient. In addition, Parteck® ODT has a pleasant mouth feel and tastes well, precisely what patients expect when taking an ODT. Patel et al. studied the effect of varying concentrations of superdisintegrants such as; Ac-Di-Sol, sodium starch glycolate and crospovidone in zolpidem tartrate immediate release directly compressed tablets. They reported that the disintegration time of the immediate release tested tablets was observed to be 35-52 sec and the order was Ac-Di-Sol < Crospovidone < Sodium starch glycolate. In another study, effect of Crospovidone and Croscarmellose sodium in Montelukast sodium mouth dissolving tablets were compared. It was shown that, in the absence of any superdisintegrant, disintegration and wetting time of the tablets were longer while the water absorption ratio was very low. Also, an increase in the concentration of superdisintegrant significantly decreased the wetting time of the tablets, therefore disintegration times were also affected . After the formulation studies, Rasagiline ODTs were evaluated by means of in vitro quality control tests and with the help of in vitro studies, the best formulation that has the optimum characteristics of Rasagiline ODTs was chosen for in vivo studies. Rasagiline (Orchid Chemicals & Pharmaceuticals; India), Eudragit EPO (Evonik Röhm GmbH; Germany), Avicel PH 101 (Microcrystalline cellulose, FMC Biopolymer; USA), Mannitol (Parteck Delta M; Merck KGaA; Germany), Aerosil (Evonik Röhm Gmb;, Germany), Magnesium stearate (Magnesia GmbH; Germany), Crospovidone (Polyvinyl povidon K-30, BASF; Germany), Granulated sugar (DEVA; Turkey), Parteck® ODT (Merck KGaA; Germany), Ac-Di-Sol (FMC Biopolymer; USA), Cabosil (Wacker Chemie AG; Germany). Rasagiline, superdisintegrants and their physical mixtures were characterized by differential scanning calorimetry (DSC). DSC analysis was performed with a Shimadzu apparatus equipped with a DSC 25 cell. Weighed samples (about 3.5 mg) of Rasagiline, crospovidone, Ac-Di-Sol, Parteck® ODT and Rasagiline:superdisintegrant (1:2) physical mixtures were scanned in Al pans pierced with a perforated lid at 10°C/min in the 30°C to 250°C temperature range, under static air . Before compression, the mixture blends of all formulations were subjected for pre-compression parameters like bulk density (BD), tapped density (TD), Hausner index (HI) and compressibility index (CI) in order to compare the initial powder volume with the final (tapped) volume to predict the flowability of the ODT powder blends. BD is the ratio of total mass of powder to the bulk volume of the powder. BD was determined by the USP method I. TD is the total mass of the powder to the tapped volume of the powder and it was determined by USP method II using a tapped density tester (Aymes, Turkey) (n=50) . HI and CI were calculated using Equations 3 and 4. Composition of Rasagiline ODTs and micromeritic properties of the ODT powder blends were given in Tables 1 and 2, respectively. Table 1. Basic composition of Rasagiline ODT formulations. Table 2. Micromeritic properties of rasagiline powder blends (n=3 ± SD). All excipients used in this study are chosen as they are safe according to IIG limits of FDA. In the preparation of Rasagiline ODTs, formulation components except lubricant and glidant were accurately weighed and mixed in a cubic mixer (Erweka, Germany) for 15 min. Then aerosil was added and mixed for 2 minutes, the obtained blend was lubricated with magnesium stearate and mixed for another 5 min and the resultant mixture was directly compressed into tablets (Figure 1). All materials used were directly compressible, thus no further sieving was applied. The amount of all the tablet components except superdisintegrants were kept constant and two different concentrations (7.6% and 3.8% wt.) were chosen in order to examine the influence of superdisintegrants on ODT properties. Flat faced tablets of 262.5 mg in weight and 10 mm in diameter were compressed by using eccentric single punch tabletting machine (Korsch, Germany). Tablet thickness and hardness were maintained on average at 3.1 ± 0.05 mm and 4.2 ± 0.5 kg, respectively for the formulations. Figure 1. Manufacturing flow diagram for Rasagiline ODT production. 20 tablets were selected randomly from each batch and weighted individually to check for weight variation (Sartorius BL 210S). The weight variation test was performed according to the USP 24 (13) and the results were given in Table 3. Table 3. Physical properties of Rasagiline ODT formulations (n=5 ± SD). The diameter and thickness of ODTs were measured (n=10) from each formulation by using a calibrated digital equipment (PharmaTest PTB, Germany) and the results were given in Table 3. Hardness of ODTs was measured using hardness tester (PharmaTest PTB, Germany) and the friability was tested using a Roche friability tester. In order to measure friability, 20 tablets were weighed and put into the friability tester. Tablets were rotated at 25 rpm for 4 min, and then the friability percentage was calculated . Results were given in Table 3. A piece of paper tissue (10.75 x 12 mm) folded twice was placed in a 6.5 cm diameter culture dish which contains 6 mL water. After putting the ODT on the paper, the time for complete wetting was measured. The wetted tablet was then weighed. Water absorption ratio (R) was determined by using the following equation (15) and the results were given in Table 3. Where Wa and Wb are the weight of tablet before and after water absorption, respectively. In order to measure content uniformity, 10 ODTs were weighed and the average weight of a tablet was calculated. After finely powdering these tablets in a mortar (İldam Kimya, Turkey), a sufficient quantity equivalent to the average weight of a tablet content was accurately weighed from this powder and phosphate buffer saline pH 6.8 (PBS 6.8) was used to dissolve the active material. Solution was then made up to 100 mL in a volumetric flask with PBS 6.8. After filtering, 1 mL of this solution was taken and put into another volumetric flask. Then it was diluted to 100 mL with the same buffer and absorbance value of Rasagiline was determined UV spectrophotometrically at 210 nm (Shimadzu UV 1240; Japan). The amount of drug substance in the sample was calculated with the aid of the calibration equation (n=3) . The results of content uniformity were given in Table 3. In vitro drug release was determined using USP 24 Apparatus II (paddle assembly) at 50 rpm maintained at 37 ± 5°C in 900 ml of PBS 6.8 as dissolution medium. Percent of drug release was determined by taking an aliquot of 5 mL at different time intervals, filtering through whatman filter paper and assaying at 210 nm. An equal volume of fresh dissolution medium was replaced to maintain the original volume. The dissolution studies were carried out in triplicate . The ODT formulation that complied the optimum properties (F2.1) was applied against the same formulation prepared with and without taste masking agent (coded as (+) EPO, and (-) EPO, respectively) by a single blind study, based on taste comparison by nine volunteers from whom informed consent was obtained. Human volunteers selected were aged 25-40. They were instructed to place the tablet on the center of their tongues, then the ODT retained in the mouth for 30 sec before the mouth was thoroughly rinsed with distilled water. Before applying the next ODT formulation 10 min were waited. The volunteers were asked to evaluate the taste of the formulations as ; very good (+2), good (+1), bitter (-1), very bitter (-2). After the evaluation of Rasagiline ODT formulations by means of in vitro quality control tests, in vivo animal study was performed to evaluate the bioavailability of the chosen Rasagiline ODT (F2.1) compared to conventional Rasagiline tablets. Young adult male Wistar-albino rats (n=12, 200-250 g) were randomly allocated in two groups as oral Rasagiline (conventional group; n=6) and ODT Rasagiline (ODT group n=6). The animals were housed in 12 h dark-light cycle (lights turned on at 08:00 am to 08:00 pm) under condition of controlled temperature (22 ± 2°C) and 30–60% relative humidity with free access to standard rat chow and water. All animal experiments were conducted in accordance with the National Institutes of Health Guide for the care and use of laboratory animals, and the experimental protocol was approved by the Hacettepe University Institutional Ethics Committee for the care and use of experimental animals. Following a week of adaptation (for cages, handling etc. ), control blood samples (1st day) were obtained through the tail vein of all the animals and processed as described followed by the application of the Rasagiline forms as described below. The drugs were applied in the morning between 9:00 am-10:00 am for 5 consecutive days . The commercial Rasagiline preparation (Azilect tablet) was dissolved in distilled water and applied via oral gavage (3 mg/kg/day) to the animals in conventional group, the ODT group received the same dose by placing the ODT tablets into the mouth of the animal and keeping the mouth closed until it disintegrates. The ODT group also underwent gavage procedure with the same volume of distilled water. Since Rasagiline reaches its maximum stable plasma level in 3 days [16-18], we applied the formulations for a period of five days to achieve stable plasma concentration. On the fifth day, serial blood samples were obtained staring from zero time in 30 minute intervals for two hours after drug applications via tail vein. All the animals were sacrificed under ketamine (90 mg/kg) anesthesia following last blood sampling for determination of drug concentration and MAO enzyme activity inhibition. The skull was opened and brain tissue was gently removed and immediately frozen in the liquid nitrogen and stored at -80°C until analysis. After blood and tissue sampling the animals were sacrificed, with over dose anesthesia and exsanguination. Blood  and tissue  were prepared in accordance with the literature. Serum samples were obtained by centrifuging the blood samples in a cooling centrifuge at 3400 rpm for 10 min at 4°C. The clear serum supernatant was carefully collected and frozen at –80°C until analysis. The brain tissues were homogenized at 1:40 (w/v) in ice-cold sucrose (0.3 M), and centrifuged at 1800 g for 10 min. The final supernatants and precipitates were treated differently after recentrifugation of the first supernatants at 12700 g for 30 min. The supernatants were collected and stored at -80°C until analysis whereas the precipitates were re-suspended in 250 mL of sucrose (0.3 M), and were layered onto 20 mL of 1.2 M sucrose. The MAO protein precipitates were obtained after centrifugation in 1.2 M of sucrose at 12700 g for 40 min. Following a single wash in potassium phosphate buffer (pH 7.60, 100 mM), the pure brain MAO protein precipitates were suspended in 10 mL of potassium phosphate buffer; and stored in aliquots of 1 mL at -80°C for subsequent analysis. All procedure was performed at 0-4°C. Supernatants of the tissue homogenates and serum samples were transferred to -20°C the day before Rasagiline level determination was performed by liquid chromatography/mass spectrometry (Triple Quadrupole; LC-MS/MS) and presented as ng/mL. MAO activity determination was performed by the method modified by Huang et al. . Briefly, 800 mL of potassium phosphate buffer solution (pH 7.60, 100 mM), 200 mL of MAO protein homogenates and benzylamine was incubated for 20 min at 37°C. The reaction was initiated by adding benzylamine (150 mL, 0.016 M) in 100 mM buffer and terminated by adding perchloric acid (200 mL of 10%). 3 mL of hexamethylene was added to the reaction solution and vortexed for 3 min. Following centrifugation at 10600 g for 6 min, absorbance was determined at 242 nm. The protein concentrations of MAO were determined using the Bicinchoninic acid (BCA) method , with bovine serum albumin (BSA) as the standard. MAO protein concentration was expressed as microgram per microliter (μg/μL). The results of the in vivo experiments were evaluated by SPSS 20.0 software programme. The data was normally distributed so between-group comparisons were performed by Student’s t test and repeated measures for plasma Rasagiline levels were done by ANOVA. P < 0.05 was considered as statistically significant. Before compressing tablets, flow properties of the powder mixture were analyzed as it is important for the uniformity of mass of the tablets. According to the results given in Table 2, all formulations showed low HI and CI values (between 1.27 ± 0.07-1.34 ± 0.06 and 21.30 ± 4.63-25.33 ± 3.0 for HI and CI, respectively) indicating a fairly good flowability of powder mixture. Tablets produced were of uniform weight (257.5 ± 4.33-265.6 ± 3.75 mg) with acceptable weight variations (CV ≤ 5% for each formulation) due to uniform die fill. Average hardness value of 4.22 ± 0.50 kg/cm2 and friability loss under 1% indicated a good mechanical resistance for the tablets. Drug content was found to be high (98.57 ± 9.69-106.97 ± 9.57) and fits to the content uniformity criteria of USP 24  for all Rasagiline ODT formulations (Table 3). Higher swelling and hydration capacity (which also means higher water absorption capacity) provides a faster disintegration for ODT formulations which is a key parameter for ODTs as well as immediate release formulations. Higher disintegration rate (especially beginning in the mouth) give rise to thought that the formulation readily dissolves. Crospovidone, having a higher degree of crosslinking, tend to swell without gelation even if it is used in high concentrations. Crospovidone generally do not swell as high as Ac-Di-Sol but shows a capillary effect . In our preliminary studies, we found swelling capacities for Crospovidone and Ac-Di-Sol as 82% and 91%, and hydration capacities as 1.95% and 0.78%, respectively. Even though swelling percent of Crospovidone was less than Ac-Di-Sol, when used in high concentrations Crospovidone compressibility characteristic was found slightly better than Ac-Di-Sol (Table 2). Mohanachandran et al. reported the high compressibility of Crosspovidone as a result of its unique particle morphology, and Crospovidone does not exhibit tendency toward gel formation . On the contrary Ac-Di-Sol shows gelation and its swelling process is depends on dehydration ; it is reported to swell approximately to 4-8 times under 10 seconds. In our study, we evaluated that all the ODTs prepared showed fast wetting times, but the highest water absorption capacity was achieved with F2.1 formulation which was prepared with high amount of Ac-Di-Sol. Ferrero et al., reported that, Ac-Di-Sol provides a minimum disintegration time with a swelling mechanism when it is used at 7.6% concentration. This is believed to be the result of finer pore structure at this level of concentration which provides sufficient pressure in the pores of tablet to produce an efficient disintegration . Formulations prepared with Ac-Di-Sol were (especially with higher disintegrant concentration) released faster than the other ODTs (Tables 2 and 4). **t50%, t90%: Time to dissolve 50% and 90% of drug from ODTs. Mannitol is a frequently used excipient in ODTs. As its flow properties and therefore compatibility is poor as an untreated powder, co-processed excipients with mannitol can be an option. In that respect, Parteck® ODT consisting coprocessed mannitol combined with low ratio of croscarmellose, show better compressibility under lower compression forces and better disintegration with some swelling effect, and also has sweet taste [23,24]. In our preliminary studies, we found swelling capacity as 8% and hydration capacity 0.06% for Parteck® ODT. Even though the swelling and hydration capacities were not as high as other disintegrants used in the study, F3.1 and F3.2 formulations prepared with Parteck® ODT also showed good water absorption, fast wetting time characteristics (Table 3) and also drug release was faster than the formulations prepared with crospovidone (Table 4). DSC thermogram of Rasagiline (Figure 2) gave a sharp endothermic peak at about 161°C which is very close to the data given in literature [2,25]. 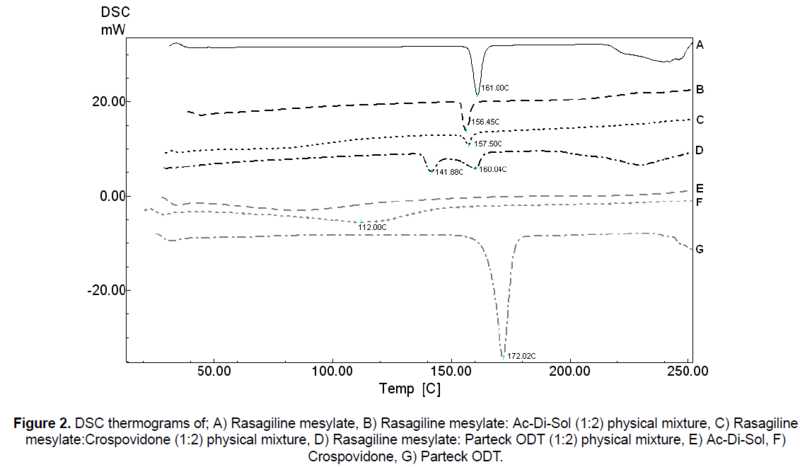 When the drug was combined with disintegrants as a (1:2) physical mixture, same distinct endothermic peak of Rasagiline was found at between 156-161°C in all thermograms. This indicates the crystalline state of Rasagiline in the mixture and also the negligible change in melting point of Rasagiline reveals to the non-interaction with the disintegrants used in the formulations. Figure 2. DSC thermograms of; A) Rasagiline mesylate, B) Rasagiline mesylate: Ac-Di-Sol (1:2) physical mixture, C) Rasagiline mesylate:Crospovidone (1:2) physical mixture, D) Rasagiline mesylate: Parteck ODT (1:2) physical mixture, E) Ac-Di-Sol, F) Crospovidone, G) Parteck ODT. Wetting is the first step of disintegration and dissolution; thus, while developing ODTs wetting time needs to be optimized. 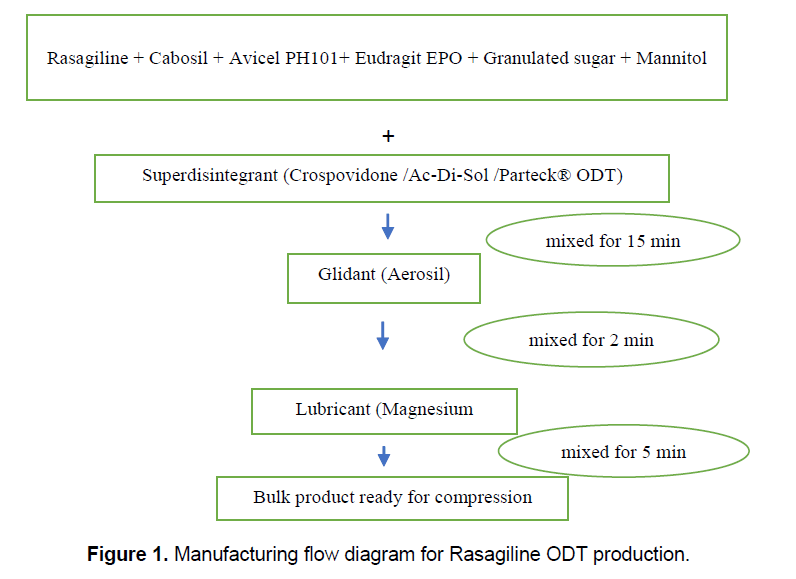 In the present study, wetting time for Rasagiline ODTs were determined as between 9.00 ± 0.90 and 32.56 ± 7.60 sec fulfilling the official requirements (<3 min) for orodispersible tablets . In ODTs containing crospovidone, a decrease was noted in the wetting times with an increase in the disintegrant concentration (3.8% and 7.6% for F1.2 and F1.1, respectively). These results suggest that the wetting times can be decreased by using wicking type of disintegrant; crospovidone. Short wetting time (9.00 ± 0.90-14.30 ± 0.62) were determined for F2.2 and F2.1 formulations, respectively and water absorption ratios were also found high especially for the higher concentration of Ac-Di-Sol (31.37 ± 0.17-87.25 ± 0.43 for F2.2 and F2.1 formulations, respectively). As Ac-Di-Sol has a high swelling and hydration capacity (values were found as 91% and 1.95, respectively in our preliminary studies); the addition of this disintegrant into ODTs can enhance the rate and percent of water uptake . Formulations prepared with Parteck® ODT also showed short wetting time values (10.18 ± 3.44 and 11.10 ± 5.37 for F3.2 and F3.1, respectively); however, water absorption ratio results (48.77 ± 0.34 and 50.41 ± 0.34% for F3.1 and F3.2, respectively) were not higher as formulations containing high amount of Ac-Di-Sol (F2.1). Although Parteck® ODT has croscarmellose sodium in its constitution, as the main part of its texture is composed of spray granulated mannitol; mannitol’s effect on wetting time and water absorption was superior to croscarmellose sodium. Any significant change was not observed in the wetting time values and absorption ratios of F3 formulations with the increasing level of Parteck® ODT from 3.8% to 7.6%. All ODT formulations met the acceptance criteria of FDA for orodispersible tablets . The influence of superdisintegrants on the dissolution of Rasagiline from the ODTs is shown in Figure 3 and Table 4. According to the D5% values for ODTs (Table 4), it is observed that superdisintegrant type and concentration affected the dissolution rate significantly; except for F2.2 and F3.2 formulations. Time for 50% and 90% of drug release values (t50% and t90% values) also revealed the same result. While the formulations containing crospovidone had t50% and t90% value ≥ 5 minutes, ODTs formulated with Ac-Di-Sol and Parteck® ODT was dissolved under 5 minutes (Table 4). These results indicated that dissolution parameter values of crospovidone, Ac-Di-Sol and Parteck® ODT tablets are in consistent with the wetting time values observed. Figure 3. Percent of Rasagiline released from ODT’s. When the release profile of ODTs evaluated for their similarity and difference with f1-f2 tests, Rasagiline ODTs was found to give different release profiles which showed that both type and concentration of superdisintegrant had effect on drug release; except F2.2 and F3.2 . Contrarily, F2.2; containing low amount of croscarmellose and F3.2; containing Parteck ODT (consisting of mannitol and croscarmellose) showed similarity (f1=2.98 and f2= 61.13) as both of them have low amount of croscarmellose in its structure. Taste comparison of placebo F2.1 formulation prepared with Ac-Di-Sol was tested either in existence of Eudragit EPO or not. Nine human volunteers were used in the study and five of the volunteers reported ODTs having Eudragit EPO as being “good taste” on the perception scale and four of the volunteers reported ODTs having Eudragit EPO as “bitter” while most of the volunteers reported ODTs without Eudragit EPO as “bitter” or “very bitter”. Results are given in Table 5. Very near scaling for both (+) EPO and (-) EPO was thought to be the result of Eudragit EPO’s preparation and addition method. In our previous study (4), the drug was pre-mixed and melted with Eudragit EPO. In this way of granulation process, Eudragit EPO homogeneously covers the drug for better taste masking. The age and body weight of the experimental groups were similar (6.2 ± 0.9 weeks of age and 235.7 ± 19.8 g and 6.1 ± 1.1 weeks of age and 247.3 ± 17.4 g for conventional and ODT groups respectively). The serum Rasagiline levels are given in Figure 3. Although the serum levels were similar in the first day of the experiment, the samples obtained at the 5th day were different. 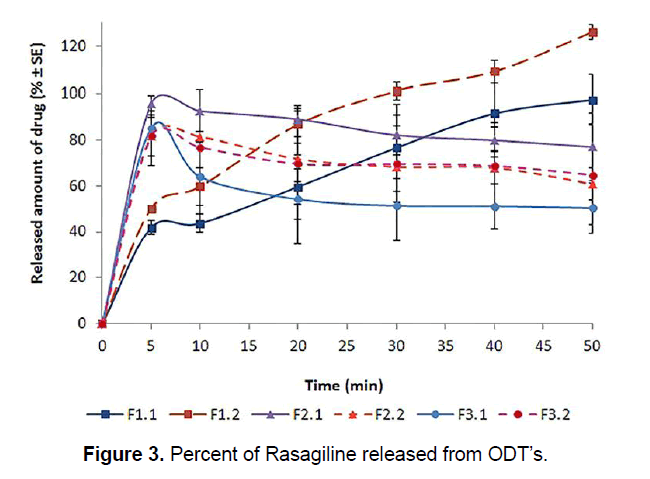 Even in the 0 min samples, just after application of daily dose, the Rasagiline level was higher in ODT group although it failed to reach statistical significance, whereas 30th min and 60th min measurements revealed statistical significance in favor of ODT group. The peak drug levels (83.15 ± 7.99 ng/mL in conventional and 147.69 ± 9.68 ng/mL in ODT groups) were measured at the 30th min (Figure 4). The brain Rasagiline concentration also differed significantly, and found to be higher in ODT group (27.14 ± 1.81 and 51.26 ± 2.56, P<0.05). The results of the in vivo studies revealed higher plasma Rasagiline concentration in the ODT applied animals which support the escape from first pass elimination in liver in this pharmaceutical form. When taken together with the MAO-B protein amount and MAO-B activity in brain, the ODT form for Rasagiline is promising. Since, although the MAO protein amounts are similar in both experimental groups, the enzyme activity was significantly less in ODT group in accordance with the higher plasma and brain Rasagiline concentrations. The preliminary results obtained from the current study worth further investigation in Parkinson models. Precompressional parameters for Rasagiline ODTs indicated fair flow properties. Postcompressional parameters and in vitro dissolution results were also studied. All Rasagiline ODT formulations satisfied the requirements of FDA for rapid dissolving tablets and allowed more than 85% drug to be dissolved within 30 minutes (Table 4). Among the investigated superdisintegrants; Ac-Di-Sol is found more effective with its higher concentration (7.6%). This result is attributed to its enhancing the rate and percent of water uptake effect. Finally, it can be concluded that, the “patient-friendly dosage form” of bitter drugs, can be successfully formulated using novel taste masking agents like Eudragit EPO but it is better to apply a granulation of drug and Eudragit EPO procedure. Rasagiline ODTs may be an alternative drug delivery method to overcome the low bioavailability problems occurred with conventional therapy. The authors report no conflicts of interest. The authors alone are responsible for the content and writing of this paper. Comoglu T and Unal B. Preparation and evaluation of an orally fast disintegrating tablet formulation containing a hydrophobic drug. Pharm Dev Technol. 2013;20(1):60-64. Ravi PR,et al. Nasal in situ gels of Rasagilinemesylate: improvement in bioavailability and brain localization. Drug Delivery. 2015; 22(7):903-910. Chen JJ and Swope DM. Clinical pharmacology of Rasagiline: A novel, second generation propargylamine for the treatment of Parkinson disease. J ClinPharmacol. 2005;45:878-894. Prakasam K andBukka R. Evaluation of cellulose polymers for buccal film formulation of rasagiline2014;7(3):83-87. Comoglu T, et al. Formulation and in vitro evaluation of ketoprofen fast-dissolving tablets. Pharm Dev Technol. 2015;21(8):901-908. Mohanachandran PS, et al. Superdisintegrants: An overview. IntJ Pharm Sci Rev and Res. 2011;6(1): 105-109. Druffner A, et al. Selecting superdisintegrants for orally disintegrating tablet formulations. Pharm Technol.2006;2006(5). Pabari RM and Ramtoola Z. Effect of a disintegration mechanism on wetting, water absorption, and disintegration time of orodispersible tablets. J Young Pharmacists. 2012; 4(3):157-163. Soh JLP, et al. Characterization, optimization and process robustness of a co-processed mannitol for the development of orally disintegrating tablets. Pharm Dev Technol. 2013;18(1):172–185. Parteck ODT Technical Information. http://www.phexcom.cn/uploadfiles/2011126103726995.pdf on 27.10.2016. Patel HP, et al. Formulation and evaluation of immediate release tablets of zolpidem tartrate by direct compression. IntJ Pharm Sci Rev and Res. 2011;7(2):80-85. Patil A, et al. Formulation and evaluation of mouth dissolving tablets of montelukast sodium. Res J Pharm BiolChem Sci. 2011;2(3):268-274. The United States Pharmacopeia (24). Rockville, MD: The United States Pharmacopeial Convention, Inc. 2000. European Pharmacopeia 4.0. Council of Europe, Strasbourg, France, 2002. Kulkarni AP, et al. Development of oral disintegrating tablet of rizatriptan benzoate with inhibited bitter taste. Am Euroasian J Sci Res 2012;7(2):47–57. Lin Y, et al. Comparative single-dose pharmacokinetics of Rasagiline in minipigs after oral dosing or transdermal administration via a newly developed patch. Xenobiotica 2013;43 (8):705-710. The clinical pharmacology and biopharmaceutics review(s) of Rasagiline by FDAhttp://www.accessdata.fda.gov/drugsatfda_docs/label/2014/021641s016s017lbl.pdf. Thebault JJ, et al. Tolerability, safety, pharmacodynamics, and pharmacokinetics of Rasagiline: a potent, selective, and irreversible monoamine oxidase type B inhibitor. Pharmacother. 2004;24:1295–1305. Ravi PR, et al. LC Method for Determination of RasagilineMesylate in Different Plasma Matrices and its Application to Oral Pharmacokinetic Study in Rabbits. J Chromatograp Sci. 2013;51:1-7. Huang G, et al. A spectrophotometric assay for monoamine oxidase activity with 2,4-dinitrophenylhydrazine as a derivatized reagent. Analytical Biochemistry. 2016;512:18-25. Walker JM. The Bicinchoninic acid (BCA) assay for protein quantitation, Methods Mol Biol. 1994;32: 5-8. Ferrero C, et al. Jimenez-Castellanos R. Disintegrating efficiency of croscarmellose sodium in a direct compression formulation. Int J Pharm 1997;147:11-21. Stoltenberg I andBreitkreutz J. Orally disintegrating mini-tablets (odmts) a novel solid oral dosage form for paediatric use. Eur J Pharm Biopharm.2011;78(3):462-469. Shu T, et al. Studies of rapidly disintegrating tablets in the oral cavity using co-ground mixtures of mannitol with crospovidone. Chem. Pharm Bull. 2002;50(2):193-198. Kunasekaran V and Krishnamoorthy K. Compatibility studies of Rasagilinemesylate with selected excipient for an effective solid lipid nanoparticles formulation. Int J Pharm Pharm Sci. 2015;7 (1):73-80. Garud SS, et al. A review on: Orodispersible tablet (ODT) technology-A novel approach to develop the supergenerics. Int J PharmSci Rev and Res. 2014; 26 (2):231-236. Comoglu T. Formulation and evaluation of carbamazepine fast disintegrating tablets.PharmazeutischeIndustrie 2010;72 (1):150-158. Yuksel N, et al. Comparison of in vitro dissolution profiles by ANOVA-based, model-dependent and -independent methods. Int J Pharm. 2000;209:57-67. Draskovic M, et al. In vitro and in vivo investigation of taste masking effectiveness of Eudragit E PO as drug particle coating agent in orally disintegrating tablets. Drug DevInd Pharm. 2016;43(5):723-731.